The Custodian of the Two Holy Mosques, Saudi Arabia’s King Abdallah bin Abdulaziz al-Saud has extended a grant of US$35 million to help fight Ebola in West Africa. 1- Providing schools with thermal sensors and medical examination equipment designed to diagnose the disease, thereby facilitating its treatment and preventing its spread. The equipment will allow governments to open schools for the current academic year. Pupils will be examined at entry to ensure they have not contracted the disease, thus reassuring parents about the safety of their children at school. 2- Providing thermal sensors and medical examination equipment at airports, railway stations and bus stations to diagnose the disease and ensure early treatment. 3- Establishing a specialized treatment centre in each of the three endemic countries, Sierra Leone, Guinea and Liberia, designed to serve suspected cases in schools, hospitals and public transport, and wherever contamination is likely to occur in crowded conditions. Suspected cases will be received in these centres for further medical tests before they are referred for specialized treatment if necessary. 4- Establishing a specialized treatment centre in Mali where Ebola appears to have broken out but is not widespread. The centre will help the country’s health authorities cope with potential epidemics in the future. 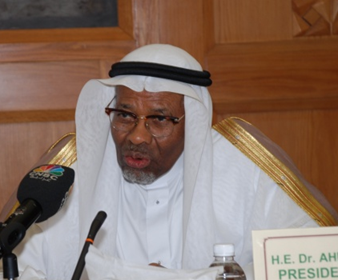 The IDB President emphasized that the kind donation made by the Custodian of the Two Holy Mosques will further boost the Islamic world efforts in supporting the international fight against Ebola. He added that the equipment financed by this donation will speed up the opening of schools in the countries concerned, reinforce the institutional and health infrastructure to fight the current epidemic and any potential epidemics in the future, Allah forbids, thus saving thousands of lives and ensuring the safety of those at risk of contamination. Dr. Ahmed Mohamed Ali implored Allah to preserve the Custodian of the Two Holy Mosques King Abdallah Bin Abdulaziz for his kind deeds to save the lives of people in line with Allah’s saying in the Quran "and that whoever saves one life should be regarded as though he had saved all mankind". He also prayed the Almighty to cure the sick and to protect humanity from all evils and disease.